You have a variety of different tile options you can choose from to make your home look fancy and stylish. It’s a cost-effective and environment-friendly flooring option that gives a distinct, elegant feel to your home. Tile manufacturing doesn’t necessitate the use of harmful substances, like heavy chemicals, and still make them durable and long-lasting. 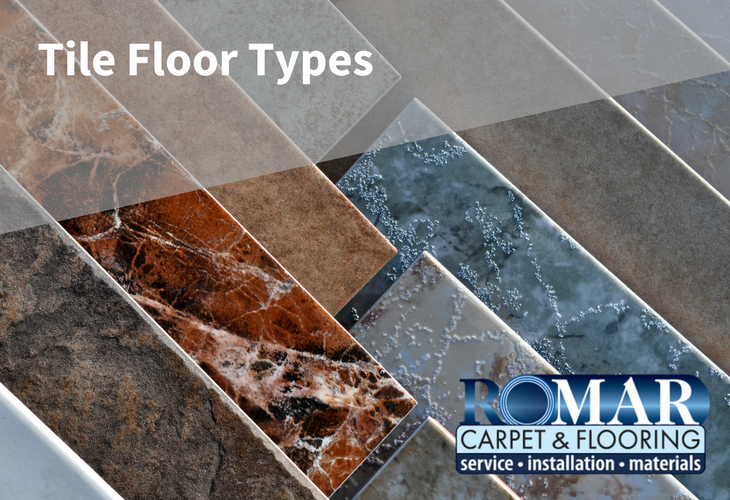 If that convinces you to get your floor tiled, check out some of the popular tile floor types for your home. Starting with the most commonly used tile flooring material, ceramic tiles are available in many different colors, shapes, and designs. A mixture of clay is heated at a high temperature to make a ceramic tile. The colors come from the glaze that is added after the heating starts. You can use these tiles for interior and exterior floors, swimming pools, and walls. To be precise, porcelain tile is a type of ceramic tile. However, there are two major differences between these tile materials. Porcelain tiles are heated at a higher temperature and use more condensed clay than ceramic tiles. The material makes these tiles much more resistant to dirt and water. The cost of installation is also higher, due to the additional density and hardness. It is one of the toughest natural stone tiles, which is resistant to scratches, cracks and breaks. However, you do have to place apply a seal on the floor to protect it from stains. If maintained properly, slate tiles can last for a long time. They look perfect in almost every room. This type of tile is available in a wide range of shapes and sizes. Granite tiles are waterproof and naturally anti-bacterial. Therefore, you will mostly find these tiles in bathrooms and kitchen tops. These attractive tiles will surely make your bathroom look beautiful and stylish. One of the oldest materials used for flooring, most of us have seen marble tiles used in our homes since our childhood. The variation in colors for each piece bring out a unique look, which many homeowners love. If you want your room to have a natural and beautiful appearance, you should definitely opt for limestone tiles. They are easy-to-maintain and durable, and can last for decades. You don’t have to worry about focusing much on cleaning them because they’re antibacterial and mold resistant. If you want to get creative with your bathroom or kitchen, you can use mosaic tiles. They are made of clay compositions or porcelain material. These tiles are a great option for smaller areas, like bathroom walls or kitchen counters. They come in various shapes and colors, but are small in size. Though there are many tile floor types available in the market, these are the most recommended ones for homes. Using tile floors, you can make your living space look classy and unique. Comparatively cheaper than other flooring options, anyone with a standard budget can afford these tiles. The vast choice of tile floors gives you the freedom to introduce a new pattern in every room. Did you like this post and find it useful? If you did, do share it with your loved ones, so that they can also find out about different tile options. Which type of tile material do you think is the best option? Let us know in the comments section below. That was a nice information, thank you for sharing. It’s a pleasure to visit here. You can also visit us in Liberty Flooring Center . I do like it when you mentioned that although granite tiles are more expensive than the others, it is extremely durable, crack resistant, and waterproof, making it an ideal choice for the kitchen and bathroom. That is good to know since my parents are planning to have the bathroom and kitchen renovated next month. I decided to research the flooring materials that will work best for our situation, and I’m glad that I came across this post. Thank you for sharing.